Audits can often be inconvenient and disrupting. This is particularly true when it comes to the specialized arena of unclaimed property reporting – where audits can look back as far as 20 years. This new whitepaper, titled “Audit Risk Red Flags: The Inside Story”, lays out 17 factors that heavily influence the likelihood of, or severity of, an unclaimed property audit.  Learn how to protect yourself when reporting unclaimed property and take action! Understand and identify what activities can all but ensure an unclaimed property audit. Learn what to do if your company has already triggered one or more of these red flags. How to avoid or minimize the potential penalties that state and/or third-party auditors will assess, including interest, fines, and penalties above and beyond your actual liability. How to prepare for and reduce the impact if your company is currently facing an audit. "Audit Risk Red Flags: The Inside Story".